Three Bridges manager Paul Faili praises Haywards Heath for being 'brilliant all season' while his side drew too many games. The Bridges boss gave his reaction to finishing runners-up to Heath in the Southern Combination League despite soundly beating Worthing United 5-1 at Jubilee Field. He said: "Today was all about Haywards Heath and what they were doing. We had a job to do, we had to do it and we got it done and it was a good result all-round to be fair. "Congratulations to Haywards Heath - they have been brilliant all season to be fair and we have drawn too many games. "We lost the title on Thursday night when Crawley Down Gatwick came out to defend and we drew." But Faili and the team are celebrating gaining promotion back to the Bostik League. He said: "We lost the Championship by a point however we are promoted. 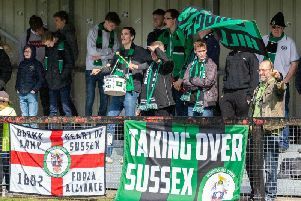 "Bostik League next season - the boys and the whole football club are just buzzing to get back there next season!"